At Hyde park Chiropractic Wellness Center, we are interested in the health of your spine and MORE. We are trained to view the body as a whole structure, with every joint, muscle, tendon, and bone working in unison to keep your body on the move. The feet are the foundation of your body, so ensuring that your feet stay healthy and problem-free benefits your entire body. When the body’s foundation (feet) is compromised, joint movement, circulation, and biochemical function throughout the body may suffer. Dysfunction in the foot, therefore, can have ripple effects, transferring problems or pain to the legs, knees, hips, spine, shoulders, and even neck. Our custom made flexible orthotics support all three arches of your feet. They are designed to keep bones, tissues, and ligaments of the feet aligned and stable so they can support the body correctly. 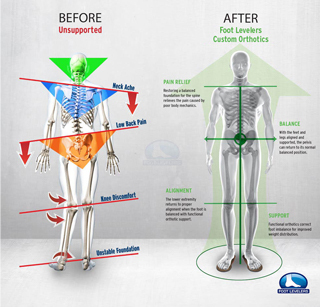 They help to properly distribute your weight and absorb shock, thereby reducing foot/ankle, knee, hip, and spinal dysfunctions and enhancing balance and gait patterns. Meat our chiropractic team and schedule an appointment for a foot scan today!